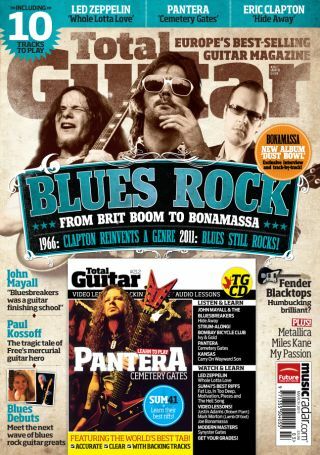 Total Guitar issue 212 is now available on newsstands and it's a blues-rock special featuring the greats of the genre Clapton, Green and Taylor as well as a huge feature on Joe Bonamassa. From the 60s blues boom in Blighty to its many guises across the world today, TG celebrates the evolution of blues rock. A look at the great British blues explosion and Mayall's holy trinity of lead guitarists: Eric Clapton, Peter Green and Mick Taylor. On carrying the blues rock torch and his new album, 'Dust Bowl'. An in-depth profile of the Free guitarist and unsung hero of British blues rock. On the making of their second album 'Inside This Machine' and their fusion of metal, punk and electro pop. Led Zeppelin 'Whole Lotta Love', John Mayall & The Bluesbreakers 'Hide Away', Pantera 'Cemetery Gates', My Chemical Romance 'Na Na Na' (video riff), Kansas 'Carry On My Wayward Son', Bombay Bicycle Club 'Ivy & Gold' (strum along) and five Sum 41 riffs. This month's gear section features our NAMM 2011 report, as well as reviews of the Fender Blacktop series, Peavey Powerslide, Taylor GS Mini, Charvel Pro-Mod So-Cal, T-Rex ToneBug Phaser and Electro-Harmonix Neo Clone. Win a Yamaha APX1000 electro-acoustic! Enter for your chance to bag this baby in a choice of four finishes.